It’s that time of year again, where we finish up another season and the reviews keep on pouring out. This spring season was pretty great, so I’m gonna tell you what I think are the best! 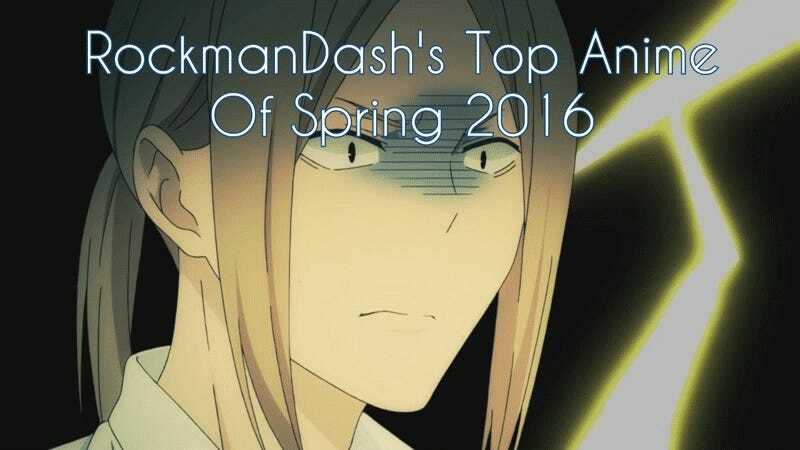 Welcome to RockmanDash’s Top 5 Anime of Spring 2016. If you watch seasonally, you’ll find that there are a few trends with seasons. From lackluster to top heavy (my personal favorite), there’s all sorts of seasons but this spring season is one that most people rather enjoy: The all around quality season. In a season like this, there’s no real show that will blow you away, but everything’s pretty great. It has the side effect of making lists like this more boring and less likely to find a personal favorite, but lots of people love it because there’s always something interesting to watch. This season was a noticeable example of this type of season in particular because *SO MUCH STUFF WAS GOOD*. Even in just the AniTAY community, there were people saying this was the best and most enjoyable season they’ve seen, which is saying something. That’s not my position, but it was a great season and there were a lot of great shows to watch. My rules of this list are simple: if it aired/released this season, it can go on this list. I don’t see the point in only giving a show one chance during it’s airing season, and this is my list so I’ll list my favorite shows regardless of what season it started on. If this means that one show hogs the top spot for 2 seasons, than good for that show! If it’s an OVA or movie that came out during the duration of the season I fell in love with, then it may be there. Also, I think that the seasonal split is arbitrary and unnecessary, so it’s completely gone here. Sorry about that, but that’s how I’m doing it. Just an FYI, the placement of the show in the list is mostly based on my experience and enjoyment of the work, so if you’re wondering why something isn’t where you think it should be or you can’t really tell via the justification, that’s probably why. Keep in mind, just because a show is lower on the list doesn’t mean it’s bad - all of these are great, and a lower placement isn’t a mark against the show, at this point it’s nearly all personal preference. Justification & Thoughts: Re:Zero is for the most part a great show with an interesting premise, solid characters and unique structure, a show that would normally be pretty high on a list like this. The reason it’s sitting as a dishonorable mention though is because it blew up on my face, irritating me to no end. The stupidity of the main character Subaru was an aspect of the show that always annoyed me, but as the show progressed Subaru became a worse and worse character, with every subsequent episode making me want to go into the show and beat him up more and more. The show has Subaru acting so stupid to the point that it breaks human comprehension, there’s no way any person or character can be as dumb as he is. Re:Zero has it’s strong points, but this fell off of my top list because it’s literally making mad when I watch it, and that’s a no go. The worst part is the show is doing this not because of the story elements like a good show may do, but because of the stupid of a character. Sorry, but no thanks. Justification & Thoughts: I’m pretty behind JoJo’s, so I actually haven’t seen this season.... Sorry! The reason it’s HM? Given my experience with the series, JoJo’s is an amazing series to the point that I’m pretty sure it should be on any top list, and I also know several people who would probably unleash their wrath if it wasn’t on a list like this so it’s gonna be here. Justification & Thoughts: At the beginning of the season, everyone was hyping Studio Wit’s newest Attack on Titan clone, and now it’s a show that’s getting a lot of hate due to a lackluster ending. The true nature of the show lies in between, a solid and enjoyable show throughout that stumbled due to bad choices in the story, but had a lot of things going for it with an interesting cast, amazing Sawano soundtrack and a cool premise. I had a good time with it regardless and when it was great it was quite excellent so it deserves a spot on this list, even if it’s only the beginning of this list. Justification & Thoughts: I’m a sucker for history, so up comes a history show about an interesting time period, a combination that got me very excited. This show wasn’t exactly what I was hyping it up to be, something that would keep the trend of great historical shows up with the quality of last season’s Rakugo, but that didn’t happen. We got a solid Production IG show, but it’s episodic nature kept the show from creating an extremely developed story that I could get completely immersed in. What we got wasn’t bad, but it wasn’t phenomenal either. Justification & Thoughts: Recently one of our admins Dexomega convinced me to watch Macross, and I fell in love with the combination of music and mech. After watching Macross Frontier, a wonderful and serious space opera with a perfect mix of romance and music, I got to see this season’s Macross Delta which I quite enjoyed even though it was a lot more silly generic anime stuff. The use of music was incredibly effective, the characters were enjoyable, the premise and the actual conflict was engaging, and of course seeing the fights were awesome. I’m incredibly glad I’ve been able to see this series and I really quite enjoyed this entry in it. Justification & Thoughts: Trigger’s little short here is some of the most fun I’ve had with a short, if not an anime in general. The short structure allows Trigger to showcase their manic nature with every episode being short bursts of insanity and fun, and then combined with all the references under the sun and you got yourselves an enjoyable work, one of the best shorts out there. Great charcters, great gags, fun use of premise: it all adds up here, and the execution of this show makes it a blast to watch, a must watch if you liked anything from the studio. Justification & Thoughts: While Flying Witch is technically about witches, it’s the quintessential slice of life, spending it’s time just doing stuff. It’s hard to for me to describe why many love this show so much, but every moment is pure bliss, enjoyable and relaxing to make your day all that much better. With funny character interactions, calming and enjoyable scenes, and entertaining moments of life that can’t help but put a smile on your face, I fell in love with this show and so did many others. It’s Slice of Life but it’s the best kind of Slice of Life, one that immerses yourself into the relaxing world it has to offer. Definitely worth a shot if you’ve ever enjoyed a slice of life show. Justification & Thoughts: Tanaka-kun was a show that took me by surprise, a comedy that didn’t seem to be my cup of tea and seemed to be a one trick pony, but proved me and many wrong with it’s immense quality. While in a season of really solid shows, Tanaka-kun was the show that got the most enjoyment and laughs out of me due to it’s fantastic cast and hilarious relationships. I loved every minute of it and throughout the season it was always my go to show whenever I wanted a good time. As more characters filtered in, the relationships got more interesting, the show got more jokes, and the show consistently got me excited and got me laughing. It was a great comedy from beginning to end and I had a lot of fun with it. You’re reading Rockmandash Reviews, a blog focused on everything revolving Visual Novels, with stuff like Tech and Anime every now and then. If you want to read more of my writing, check out AniTAY and KMTech.